Last Friday's mass protest rides on Blackfriars Bridge were the biggest cycling protests the UK has ever seen, so far as anyone can discern. Estimates of number on the 6pm LCC flashride vary from 500 to 1000, but it appeared to be at least 1000 to me. The bridge was packed with cyclists, who rode slowly from the south to the north bank and then back again between 6:15 and 6:45pm. Most of these then cycled along Upper Ground to the Critical Mass meeting point by Waterloo Bridge, and about 7pm, a huge stream of cyclists consisting of the combined groups went back up Upper Ground and slowly crossed Blackfriars Bridge again on the Critical Mass ride. I stood at the southern end of the bridge with the cyclists stopping the flow of traffic from the south, having the traditional banter with the black cab drivers, with their usual sprightly repartee, such as, "You're not allowed to hold me up, read the f---ing Highway Code!" and "You say you want safer roads, well why don't you all wear f---ing helments! 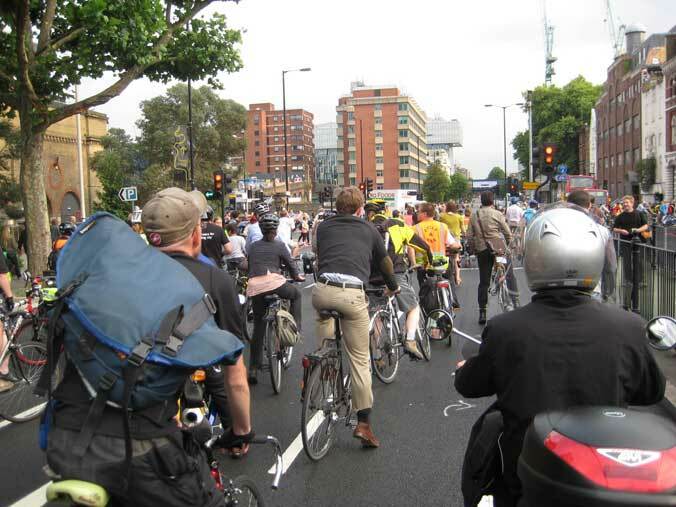 "(that one is a favourite of theirs, of which the logic seems to them unimpeachable), for the duration that it took to get all these cyclists through, and I thought there must be at least 2000 cyclists in the protest at this stage. They could not all fit on the bridge at once. The Critical Mass proceeded through the City of London and north-east, via Old Street, into the borough of Tower Hamlets. 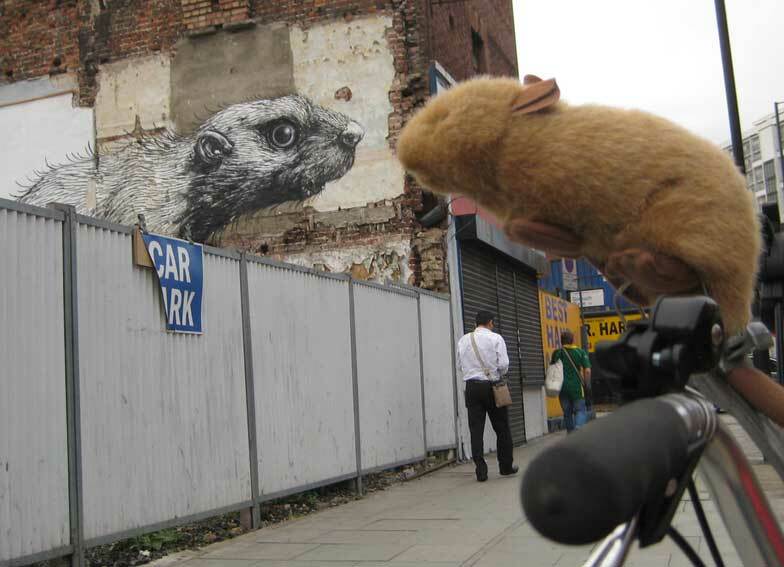 This is not an area that I and the Vole cycle to very often, and the Vole was intrigued to encounter a remarkably similar-looking rodent about 5 metres long painted on an exposed internal wall of a demolished building. I haven't been on a Critical Mass for many years. I noted how for many of the young male participants, it is a kind of "extreme sport". They relish holding the traffic at the junctions, and the argie-bargie with the taxi drivers and other motorists, often seeing to obstruct motorists trying to get in and out of side turnings quite gratuitously. The colourful cavalcade, which included some bizarre bikes and get-ups, wound back westwards through Bethnal Green and back to the City, where I left it, diving into Bank tube with the Brompton and Vole. Bank tube station at 9 pm was certainly a different experience to the same place at 6 pm. At the earlier time, it had been so horrendously packed, strained and over-capacity that it took me about 10 minutes from getting off the train to get out of the station. The only practical method was to climb up all the stairs – quite an effort with the folded Brompton. As I came out, I saw they had closed the station to incomers, as the situation inside had become quite impossible. And this I presume was a normal Friday 6 pm at Bank Station, with nothing special going on. This set me thinking how the growth in commuting cycling into the City in recent years must be in large part due to the horrendous conditions on public transport. It is clearly not due to work by Transport for London or the City Corporation in making cycling conditions any better. So we have a "cycling revolution" in London that, in so far as it exists at all, is due to "push" factors rather than a positive "pull" to cycling, which is not all that healthy. It may be a benefit to the city that more people are cycling (at least on the main commuter routes, if not elsewhere in London), but it would be nicer if people were choosing to cycle because cycling itself is pleasant. Otherwise, it is doubtful whether the Utilitarian "Sum of Human Happiness" is being increased. The protest was covered well in the Evening Standard (thanks in no small part to a canny press release put out by the Cycling Embassy of Great Britain, who officially supported the protest, the only national cycling organisation to do so (CTC, where are you?)) and on BBC and ITV news. BBC had the better coverage, giving airtime to Mark Ames, of the ibikelondon blog, and also Publicity Officer for the Cycling Embassy, who cogently explained the issues over Blackfriars. The TfL view came from Ben Plowden. Ben Plowden is TfL's "Director of Better Routes and Places". His previous title at TfL was "Director of Intergrated Programme Delivery", which job involved "bringing together key projects including walking and cycling, road safety and smarter travel". Ben Plowden is not to be confused with the environmentalist Stephen Plowden, best known to cyclists for his work with Mayer Hillman on slower speeds. Ben Plowen is clearly not interested in slower speeds (any more), despite his present and former Orwellian job-titles at TfL. 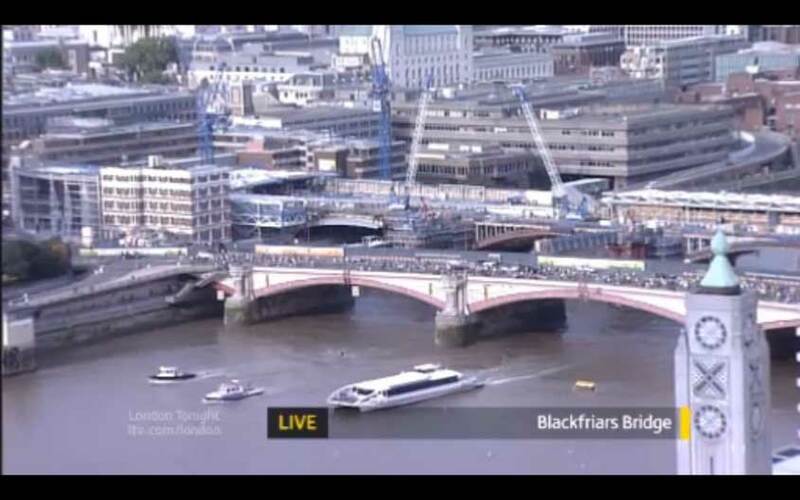 For here, in this BBC news item, he is claiming that the Blackfriars scheme, increasing the number of vehicle lanes and raising the speed limit from 20 to 30 mph, is somehow all being done for the benefit of pedestrians using Blackfriars Station! People in public life often make political transitions, for example, MPs who "cross the floor" of the House of Commons. But few can have made such a discreditable transition as Ben Plowden. For he was the first Director of the Pedestrians Association (now Living Streets), heading that organisation from 1997 to 2002. In 2001 he said "We are trying to make streets places people can enjoy." Presumably by "people" he did not mean "motorists who want to drive at speed". Carlton Reid has highlighted some of the other things Plowden said when he was in that job. And yet now, this same Ben Plowden is seriously telling us that because the 20 mph limit on Blackfriars Bridge was only put in place as a temporary measure to facilitate the lorries making deliveries to the building works at the station, it is now a good idea to raise the limit back to 30. It is hard to know where to begin with this argument. The point is that though that may have been the reason it was actually done, there are many other reasons why it was a good idea and should have been done anyway – as must Plowden know, from everything he said in his earlier job. And the changes that have taken place since have re-enforced the need for the lower limit, not removed the need for it. The increased cycle traffic since the limit was introduced, doubled since 2006, and now the largest part of the peak-time traffic on the bridge, perhaps in part because of the lower speed limit operating on this bridge, is a huge argument for 20 mph being kept – as is the history of cyclist deaths on the bridge when it had the higher limit – as is the huge increase in the number of pedestrians entering and exiting Blackfriars Station, which TfL is expecting to be 58% of the total number of people going through the junction in the future. How are these pedestrians going to benefit from a higher speed limit on the bridge and more traffic lanes? Plowden is talking dangerous nonsense, and with his intelligence and his background and experience, he must know it. How else, then, to describe the behaviour now of this erstwhile pedestrians' champion than "discreditable"? 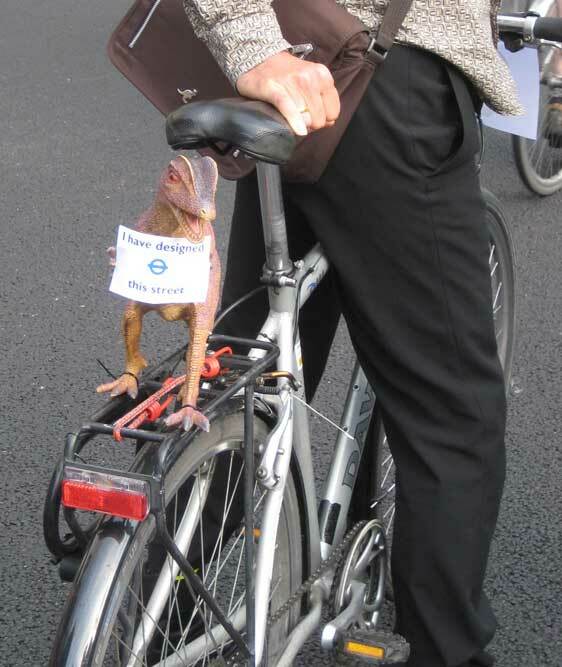 Of course, I don't know what goes on behind the closed doors of TfL (and they are very closed to cycle campaigners). It could be that Plowden still secretly holds all the beliefs that he once espoused, and is fighting desperately to get a more progressive policy out of the motoring dinosaurs at Palestera House, "towing the line" in order to hold on to his job, because he believes he can do more by staying in there and fighting for pedestrians' rights than by walking out. It may be he thinks that TfL's policies towards non-motorised road users would be even worse without him there to act as a counterbalance. Maybe one day, in the distant future, he will write his memoirs, and tell us all about this terrible time in his life, when he was so torn between expediency and belief. But it doesn't look like this. It looks as if TfL is as pro-car and anti pedestrian as it could possibly be, with Plowden in charge of the laughably named "Better Routes and Places" (is Blackfriars held to be one of those?). For another example of this, see TfL's determination to harry and incommode pedestrians by introducing widely the Pedestrain Countdown system on signalised crossings, discriminating, as the Green Party's Jenny Jones points out, against "less agile Londoners and people with children". For yet another example, see TfL's horrific designs for the new Henley's Corner in Barnet. If Plowden is really fighting the pedestrians' corner in TfL, he is failing totally. If he had the slightest consistency or integrity, he would resign from his job, telling the world the reasons for his going. His present position gives a depressing example of conduct in public life – a career gone sadly awry. Oh, I think pedestrians could benefit from increasing the speed limit at Blackfriars from 20 to 30. Certainly I can think of one.